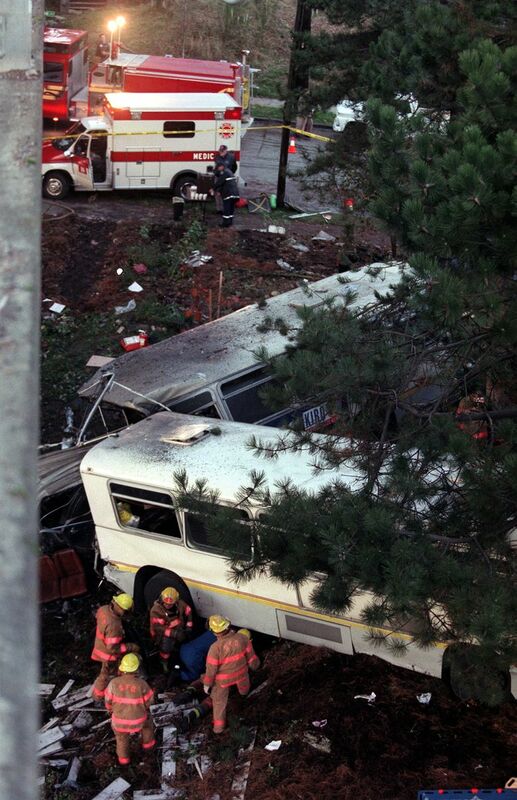 On the day after Thanksgiving in 1998, a man opened fire on the driver of a Metro bus just as it was crossing Seattle’s Aurora Bridge. The bus swerved into oncoming lanes before plunging off the bridge and onto an apartment building below. It finally came to rest in the yard of the building. Although three people were killed and more than 30 injured, the loss of life could have been much worse if the bus had gone off the bridge closer to the center of the span. The driver, 44-year-old Mark F. McLaughlin, who had been shot in the arm, died after being thrown out the bus windshield and onto the apartment roof. A second person was pronounced dead, reportedly with a gunshot wound to the head, at Harborview Medical Center. Homicide detectives were saying last night that the passenger who died may have been the shooter, said police spokeswoman Christie-Lynne Bonner. Police are investigating the possibility that the shooting was a murder-suicide. An additional 29 victims, many of them helped by onlookers who sprinted to the accident scene, were being treated in seven area hospitals, according to police and fire officials. Individual totals released by the hospitals, however, added up to as many as 33 injured plus the two dead. A later story identified the shooter as Silas Cool. He died in the crash.